It’s a Swiss tradition. On the 6th of January we celebrate the Three King’s Day by having “Königskuchen” – King’s Cake. It’s a Cake made out of sweet bread dough buns and decorated with almonds and sugar. Hidden in one of the buns is a little king figurine the person that finds it it there bun becomes king for the day. 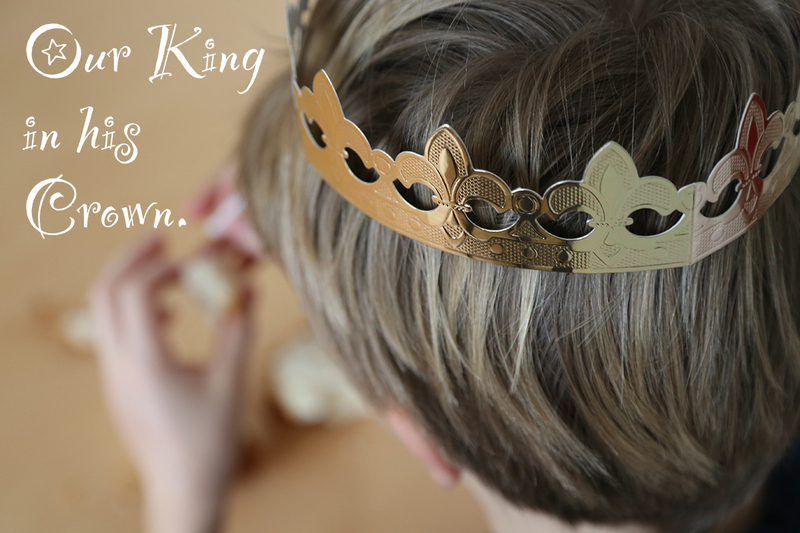 …and the king is our eldest. We bought our cake from our local bakery but if you want to give it a go here’s the recipe. Leave dough to rise for about 2 hours (until it’s size doubles). Preheat the oven at 190°C. Form the buns put a figurine in one of the buns put them together, coat the cake with the egg and decorate with the almonds and sugar. Bake for 25-30 minutes. I think more days should be celebrated with cake! What a lovely tradition. It’s a common tradition. In Mexico we celebrate it as well, though the person that finds the baby inside the cake is not king for a day but has to host the next get together. I guess we just want to keep seeing each other. That’s a fun tradition too. That’s so sweet ! The son of a friend of ours came home from school today with a little sheep. So maybe in the Valais, or the Val d’Hérens, where things are a little more rustic, shall we say, they have a different celebration called “Sheep day” ! Also, the photos are really cute and lovely! How beautiful! Love the cake and the photos of the sweet little hands! Happy Three King’s Day to you. Beautiful photos and the recipe seems so easy!! I enjoyed reading about this Swiss tradition. It sounds like so much fun. Hiding a king for someone to find it sounds like a creative and fun idea. We like these too – for us it’s more of a Mardi Gras celebration, so people purchase the same kind of cake, but it is very colorful and like Josh shared – it’s a baby that they find. Always yummy! It’s great fun hearing about all these traditions! Thanks for sharing! We used to have King Cake during Mardi Gras when I lived in Mississippi. Whoever discovered the baby had to supply the next cake or the next Mardi Gras party.